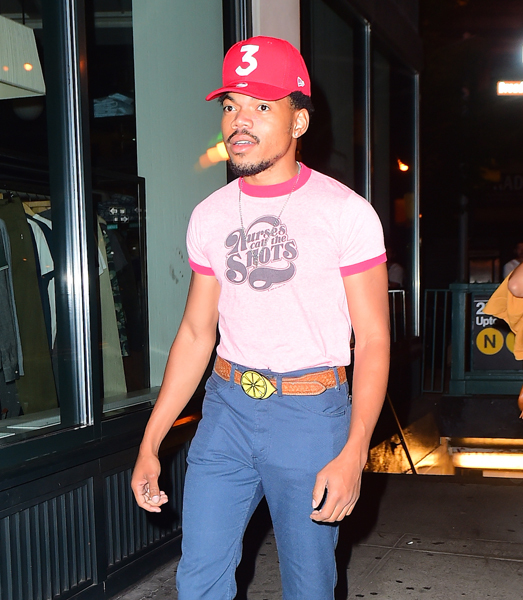 Beyoncé was a retro princess at her "Soul Train"-themed 35th birthday party Monday night in NYC. 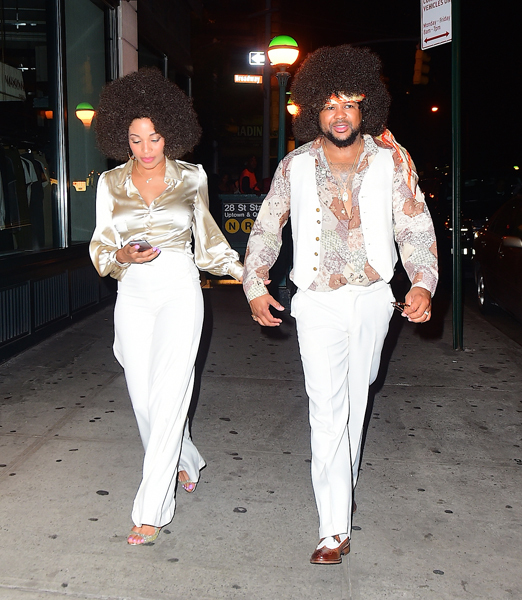 Queen Bey and friends channeled the 1970s for the bash with bell-bottoms, wigs, and more. 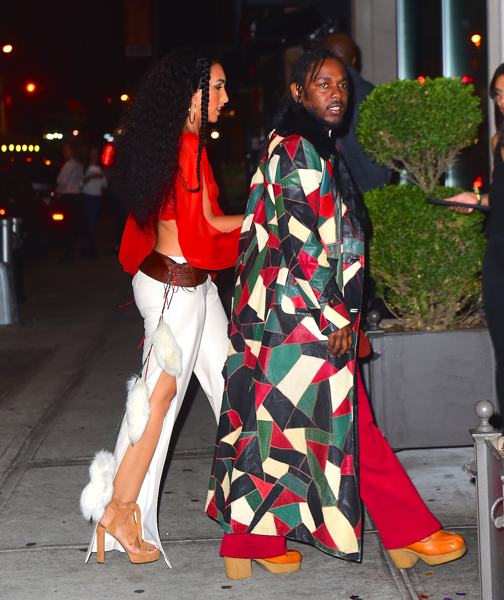 The “Lemonade” singer flashed a glimpse of her outfit as she arrived to the venue with husband Jay Z. The birthday girl stunned in a gold low-cut dress or jumper that showed off her long legs, gold platform sandals, and round sunglasses. She covered up the look with a long shimmery coat. 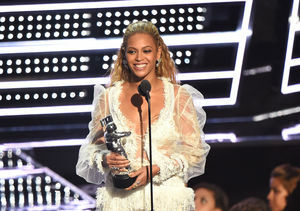 Beyoncé wore her hair in big blonde curls, somewhat reminiscent of her “Austin Powers in Goldmember” role as Foxxy Cleopatra. 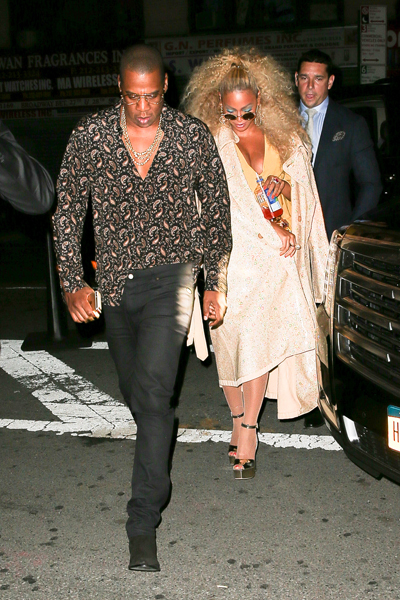 Meanwhile, Jay Z opted for a paisley button-down top, jeans, and some bold necklaces. 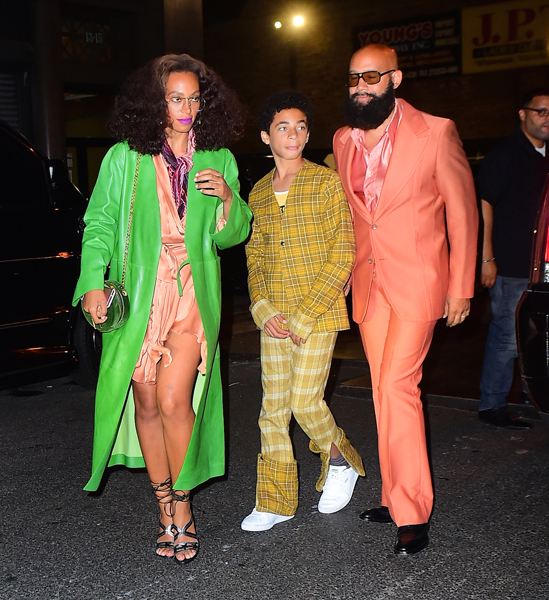 Bey’s sister Solange and her family were a colorful ensemble in green, orange, and yellow plaid! 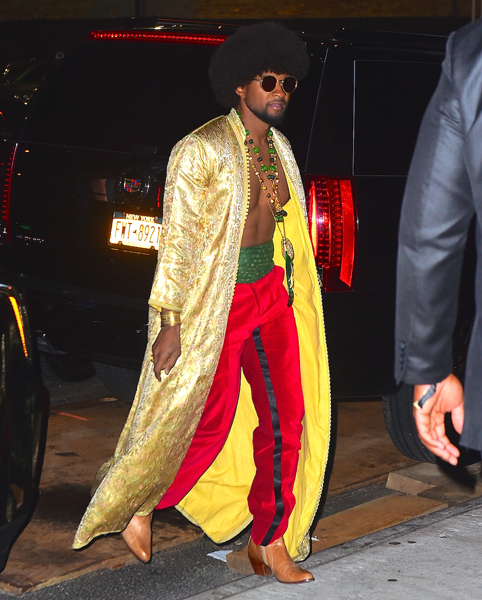 Usher was a standout in a long gold jacket, bright red pants… and no shirt. His big hair, sunglasses, and boots really took the look back in time. 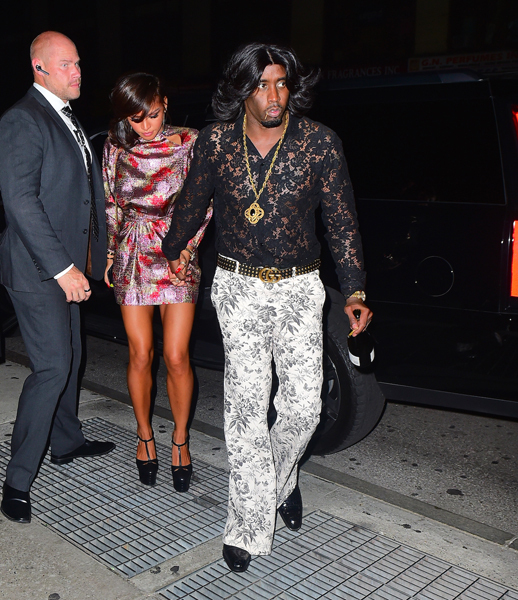 Diddy, who attended with girlfriend Cassie, also embraced the era, with floral bell-bottoms, a paisley button-down, and a long wig. 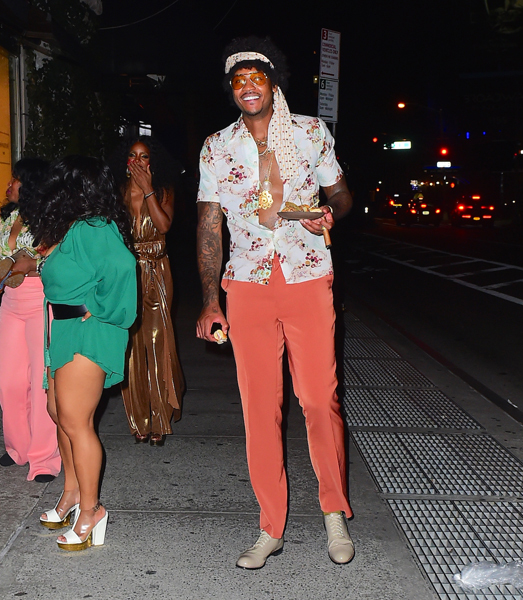 Kelly Rowland hit the mark with a plunging-down-to-there metallic jumpsuit, and husband Tim Witherspoon was the perfect arm candy in brown pants and a silky short-sleeved shirt. 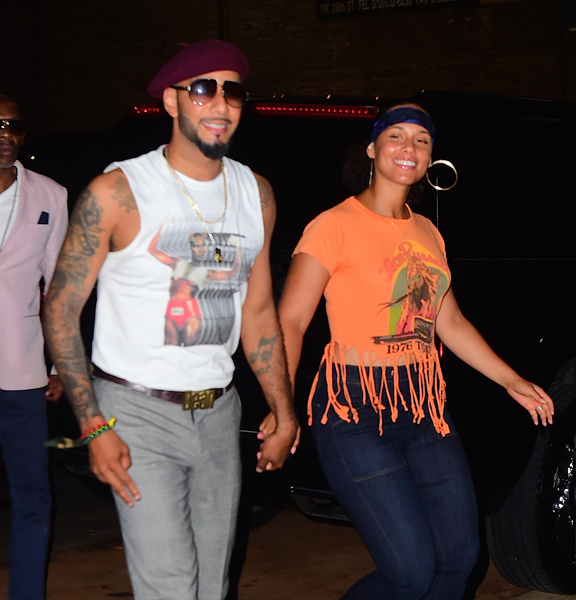 Alicia Keys looked every bit the '70s starlet in wide-leg blue jeans and an orange-fringed crop top. She wore her hair back in a ponytail, and completed the look with a headband and hoop earrings. Her husband Swizz Beatz got in on the fun, too, with gray plaid pants and a tight tank top and sunglasses. Keep scrolling for more pics!